Our Halifax based moving company is happy to provide a free moving or storage quote to meet your needs! As Halifax's premiere full service moving company, Maritime Moving and Storage understands the importance of assisting and listening to our customers. 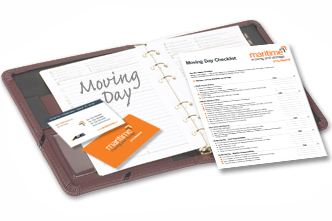 We have provided a Moving Day Checklist and Replacement Value Protection Plan to assist in your moving day planning and protection. We have also provided a Quality Service Questionnaire that can be filled out by our moving or storage customers. Maritime Moving and Storage continuously aims to improve its moving and storage process and customer service. Please help us out by taking the time to let us know went went well or suggestions for improving our moving and storage services. All forms are Adobe Acrobat Format (PDF) if you do not have Adobe Reader software installed on your computer to view/print these forms – you can download it here. I just wanted to drop you a quick note to express my gratitude for Maritime's help in my move. I appreciate how patiently and promptly you answered all of my questions. The guys were incredibly professional and showed great care picking up my belongings. The prompt turnaround in getting my belongings delivered two days later was a pleasant surprise. I was also very grateful for the transparency throughout the whole process. All of these things together made the experience a good one, especially given the stories that you hear about the industry. I would have no hesitation in recommending your services to others. Once again, thanks to you and the team for everything. Just want to say thank you for a fabulous crew yesterday. They were ‘rock stars’!! Professional and they all had a sense of humour. I was watching them and wishing I could have given each of them a bonus!!!! They worked so hard. Thank you again! From someone who will say is an experienced customer--over 20 moves or so, I can tell you these guys were super! On time, organized, tons of personality and just wanting to accommodate the customer. Ryan, Marc and the other gentleman were professional right from the start. They were so awesome that we will be requesting these 3 when we move out of storage and into our new apartment. Thanks guys and Amy (the super sales rep who gave us our quote) on making our downsizing a great experience! We wanted to pass along our appreciation to the 3 young men that worked their tails off in helping us move. They deserve credit and a pat on the back. It was a crazy hot day and they worked harder than I have ever seen anyone work. They were polite, efficient, and very careful with our belongings. They did a great job and we appreciated their work ethic. I would highly recommend your company. I wanted to touch base and let you know what a great crew of movers. They were absolutely wonderful. Efficient, quick and made sure everything went smoothly. Kudos to them. I will definitely recommend your company. Efficient, fast, polite and very friendly. Just taking a break from unpacking, but wanted to thank you for assigning us such a great crew. Wade and the guys were efficient, fast, polite and very friendly. Without a doubt next time we move I will be calling you. We wanted to extend a big thank you to the crew who moved us from Shubenacadie to Halifax yesterday. They were on time, friendly, courteous, efficient, and went the extra distance to make sure the move was as stress free as possible. I’m just writing to tell you how pleased and impressed we were with the service your team provided to us on our recent move to Mill Cove . We were just blown away by the fast efficient manner in which they operated, and they were so nice to work with! Daniel immediately took charge and virtually eradicated our stress - the others: Donald, Brennan and Alex were such great guys whom we really enjoyed spending the time with. Your estimate was spot on!